Drexler completed his championship at 12 months old, after taking 4 & 5 point majors at just 9 months. He took his first Group 1 and Group 2 the month after he achieved his championship. 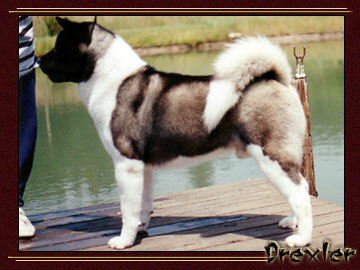 Specialed very little, Drexler ranked in the top 10 Akitas at just over a year old. 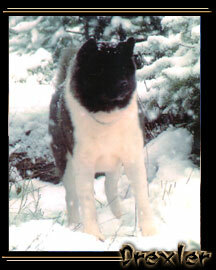 At two years old, he won the Region IV Akita Specialty, going Best of Breed over the top Akitas in the country. 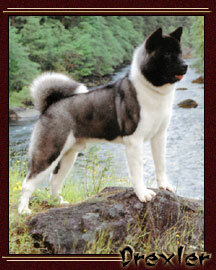 He ranked in the top three Akitas in the nation at just two years of age. Then, at 10 1/2 years old, Drexler wowed everyone by going Best Veteran at the 2002 Akita National Specialty and taking one of only four Awards of Merit given out. Although he was bred very little, Drexler is the proud sire of seven Champions with several more needing just majors or single points to finish. His daughters Revelly and Makita and son Ace have continued to carry on the legacy Drexler has established here. Not only has Drexler been the backbone of Yakedo Akitas, but he is the love of our lives and the most incredible family dog! Yes, we can say Drexler has successfully passed on his type, his bone, his incredible movement and his substance to his kids, but more than that, he has passed on his heart and soul that will always live on at Yakedo Akitas. Our deepest thanks goes out to Colleen Sullivan-Rosauser of Sondaisa Akitas for honoring us with such a beautiful friend. Drexler's Pedigree and General Information can be found below. This information is provided for your convenience. Site Menu © Copyright 2004, Yakedo Akitas.